Concept: Observe one of the featured paintings on the Community Cafe wall, and write in response. 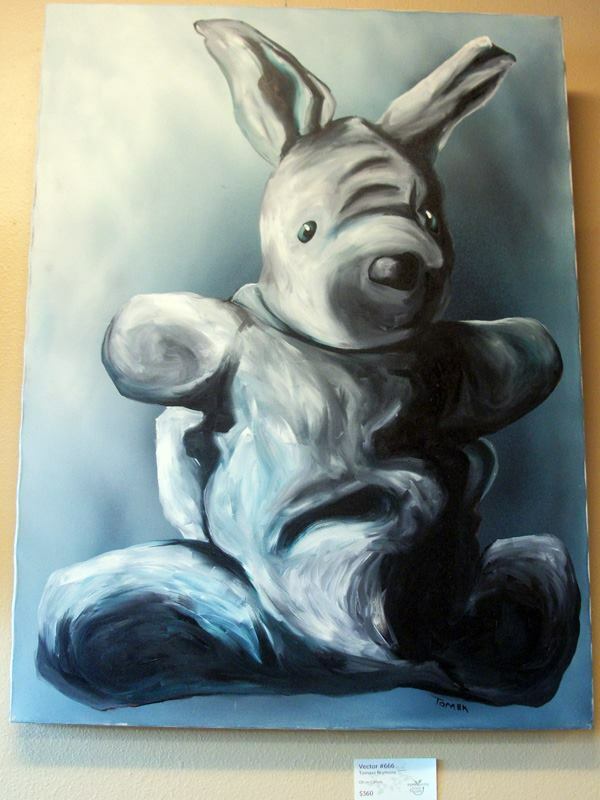 He brought the velveteen, blue-gray bunny to the bistro that evening. I’m so glad you called, he said. Where’s Jordie? He asked. When I didn’t answer, he blushed. “I brought you something.” I already saw its black leathery nose peeking out of the top of his bulky cargo pants. I watched as he fished around, knowing what he was going to do before he did it, but psyching myself to not laugh until he did it. And then he did. And I laughed so hard, so hard… I don’t remember ever laughing that hard before. Or ever since. That bunny rode on his dashboard during the six months he was away; I, back home in Florida, pretending not hearing from him every second of every minute of every damn day didn’t cause me any heartache. One scary phone call at 4am; he thought he was in trouble. I trembled for him, I cried for him, all the while repeating, “You stay alive, baby. That’s your job, stay alive,” in the steadiest voice I could. I never knew the beauty of a sunny day until the day he landed at the airfield. Safe, all in one piece, handsome in his tailored suit. It looked like the one we saw across the street from our table, on a headless mannequin behind a shop window. I squinted as sun rays coaxed him down the stairs and into my arms…yes, it is the exact same suit. In a separate bag, he carefully removed the bunny and placed it in my hands. Coated in motor oil and sand, he kept apologizing for its sorry state. I hugged the dirty, sandy bunny, the talisman that brought my heart home in one piece. And that’s why, my sweet little girl, this bunny is so old and dirty. It was busy keeping your father’s love for me alive. Posted on October 9, 2014 October 9, 2014 by Von SimeonPosted in Art, Dating, Flash Fiction, Flashback, Health, Inspiration, Just Because, Literature, Pet Life, Photography, Poetry, Relationships, Writing, Writing ExercisesTagged Dark Arts, Flash Fiction, Tomasz Brymora, Writing Prompts. Previous Previous post: It’s My Anniversary! Glad you liked it; I rarely write happy/sweet/romantic pieces, so I felt challenged. I’ll see if I can keep it going!